In 2010, I packed my bags and left my beautiful home in Perth, Australia to act upon my overwhelming desire to travel the world. Since then, I have traveled to 30 different countries (and counting!) and I was able to call Canada my home for four years living in a beautiful mountain town called Whistler in British Columbia. 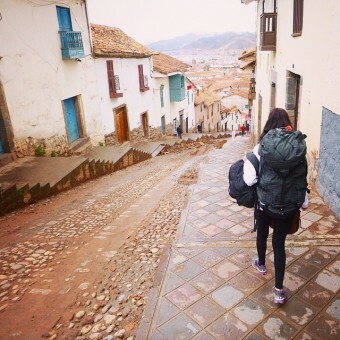 I spent the majority of my twenties overseas, backpacking and experiencing the world. I learned more than a class room could ever teach me and my life has well and truly been enriched. Now, I’ve hung up my backpack (not for good!) and called sunny Brisbane in Australia my home. I’ve gotten married to my soul mate and travel buddy (who I met travelling), brought a house together and welcomed a cute little doggo called Maple into our lives. Even though the previous statements couldn’t make me sound any more cliche if I tried, this doesn’t mean my passion for travel is over. A life full of wandering is deeply imbedded in my soul, whether it be in my own backyard or in a far away county, there is so much out there for me to discover and enjoy. So, join me as I muddle my way through this thing called life. This blog is all things travel, love and lifestyle. I stumbled upon your instagram account and your story is impressive. I started a jewelry line called Automatic Reply and I am working on content for my blog, that would then be pushed out through instagram and facebook. I would like to have a series on female travelers to inspire my readers. I was wondering if I could feature you. I am still ideating on template and questions I would like to ask. Thank you so much. I would love to be featured. Feel free to email me once you have the template sorted. Kylie.martelli@hotmail.com. I LOVE the photos you posted of Kauai, they’re all SO beautiful and I’m glad you and your husband could taste a little bit of the Hawaii life! I live on Kauai, so it always gives me joy when others enjoy the beauty this island provides for us. I really enjoy your blog, you’re a great writer! I hope to one day travel and chase my dreams as well! You’re more than welcome to check out my blog too. I have alot of writings along with pictures of the islands.